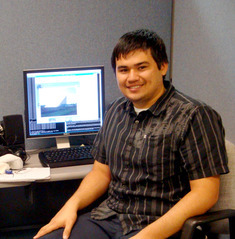 Andrew Lindstrom is a senior studying Computer Science at University of Hawai’i at Hilo, but his home is on the island of O’ahu. He enjoys troubleshooting problems and working with his hands. He plans to graduate with a Bachelor of Science in Computer Science and to work as a system administrator. Andrew likes playing games and guitar during his spare time. The task of tracking and detecting satellites orbiting the Earth is performed using a number of ground-based sensors around the world, each one tasked as an isolated system. Objectives may include tracking specific, known satellites, or detecting previously unknown objects. Both types of observations are used to update a central catalog of satellites. This data collection and catalog updating process is largely manual, and it may not scale sufficiently to handle the growing number of objects to be tracked. However, networking the sensors together and tasking them from a single facility may obtain the required scalability. This concept can be tested using software models of the existing sensors. This project’s first step is to use an existing MATLAB model in its alpha stage of development, and from it create a version that will take on a larger data set without sacrificing turnaround time. The existing model simulates the FPS-85 radar. The model was analyzed to determine which types of performance optimizations would likely provide the desired throughput using the computational resources at MHPCC, within the time constraints of a summer internship. A data parallel approach was selected. This process included taking advantage of the MATLAB Parallel Toolbox, removing user interactive features, and adding output file I/O. Initial development was completed on a multi-core Windows-based PC using a 10-satellite test set before moving the work to MHPCC’s Linux-based “Mana” cluster. The next task is to test the parallelized model’s scalability on Mana using increasing numbers of CPUs and nodes. Final outcomes will include process timing, measurements of performance vs. the number of processors used, and suggestions for more suitable parallel-processing approaches using MATLAB Parallel Toolbox, if any. Future goals of this project will include testing against a larger data set, and to test multiple models linked over a network to a resource manager. Also, the original PC-based radar simulator would benefit from additional optimization of the user interface and data displays.